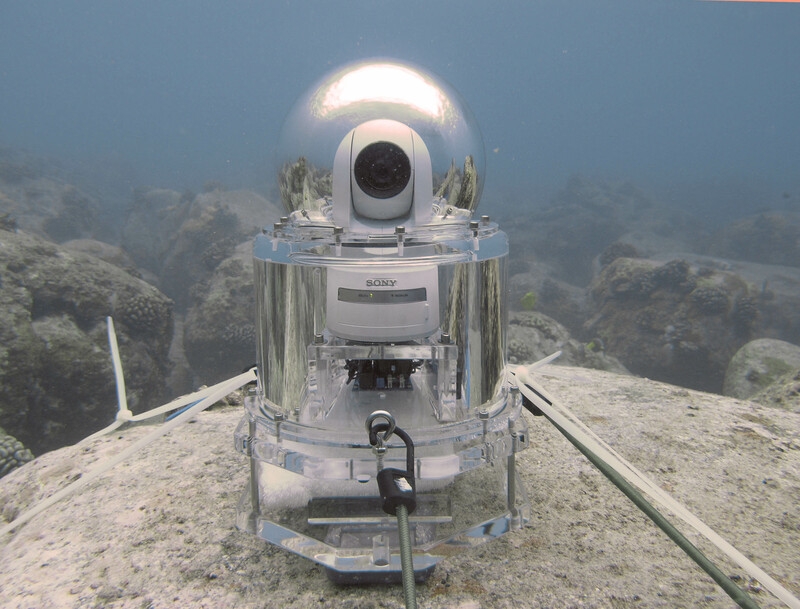 The OceanCam® was first designed for continuous monitoring of manta rays in the open ocean. A wide range of applications for housed PTZ camera systems are possible including research and monitoring of other marine, aquatic or terrestrial organisms. In additional to scientific monitoring, cameras can be used in a variety of security and monitoring applications in almost any situation, including high-humidity, Zone-1 and Zone-2 gas mixtures or harsh environments. Open water models come equipped with several security options. The housing security system employs tamper-resistant stainless steel bolts. The main o-ring system is only accessible from below. Additional tamper-resistant bolts are employed to attach the housing to the mounting base. In addition, a GPS theft beacon is available to alert to any tampering. Heavy concrete dome structures with brass locks are also available to secure the camera to the bottom. 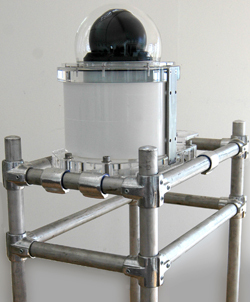 All ocean cameras require armored PoE and can employ fiber cables when distances exceed 300 feet (100 meters). Custom lengths are available. Wireless packages are also available that permit the deployment of cameras several miles from shore. Solar-recharged battery packs can be located on a buoy or on land. Custom housings, multi-camera systems, installation and maintenance contacts are also available. The HD-PTZ can cover a wide monitoring area withgreat efficiency. It features a high-speed 360-degree endless pan capability that can make a complete revolution in under one second. Downward viewing is made possible with a 210-degree camera tilt range and our uniquely designed hyper-hemisphere dome. Cameras features visibility-enhancing technologies developed to improve performance in challenging lighting conditions, such as high-contrast situations with harsh backlit and fast-moving images in low light. Our newest and most advanced model features full 1080p video at 60 frames per second, 30x optical zoom and pan-tilt speeds of up to 700-degrees per second, making this the fastest camera on the market. Cameras ship in a specially designed shipping crate. Power consumption: 27 W max.